The meeting was attended by Mr. Eduard Biriucov, the Secretary General of the PS IGC TRACECA, Mr. John Field, Team Leader of the Project, Ms. Ketevan Gvalia, Regional Coordinator of the Project, Ms. Maya Kajaya, Assistant/Interpreter of the Project, Dr. Udo Witulski, Team leader of the IDEA Project, and Experts of the PS IGC TRACECA. During the meeting the Parties discussed current status, further implementation process of the project in the view of the transition to the final stage. The Secretary General stressed the importance to continuing the project, as well as the necessity of the dialog with all involved national administrations and structures for a constructive approach for solving problems in each country ensuring the safety of land transport and sustainable development of the TRACECA as a whole. Mr. Biriucov also noted the importance of establishing the contact by the project with all local experts for more focused attention and a better understanding of situation with land transport safety in each country. During the discussion Team leader of the Project, Mr. Field informed on the completion of the questionnaire on road safety, prepared by the experts of the project. 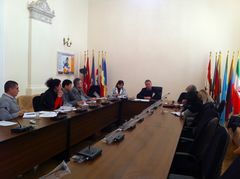 According to the results of the survey, the project is expected to organize subregional working group meetings to discuss results and elaboration of regional or subregional Action plans on road safety and the subsequent development of the final version for further presentation to the countries. The participants of the meeting agreed on the need of technical assistance of the project in the implementation of the Action Plan on implementation of the Concept of development of international road transport on the Transport Corridor Europe-Caucasus-Asia, competitiveness and attractiveness of the road routes of the TRACECA. Following the meeting it was agreed that an expert group will make all efforts to ensure sustainable functioning and implementation of the project as well as fruitful cooperation with all project stakeholders, including - the experts of the Permanent Secretariat with a view to achieving concrete results and effective solution of the issues.